ERA Pacifica Big and Tall Executive Chair [OF-PACI] 26 Inch Wide Seat! The Pacifica 24-hour chair from ERA is built on the Galaxy model, but with a difference – the Galaxy offers a 22” seat, but the Pacifica has a 26" seat width. So if you’re a bit on the large side, this is your chair. It’s rated for up to 500 pounds, and if you’re concerned about stability, you can choose an optional 30” base. 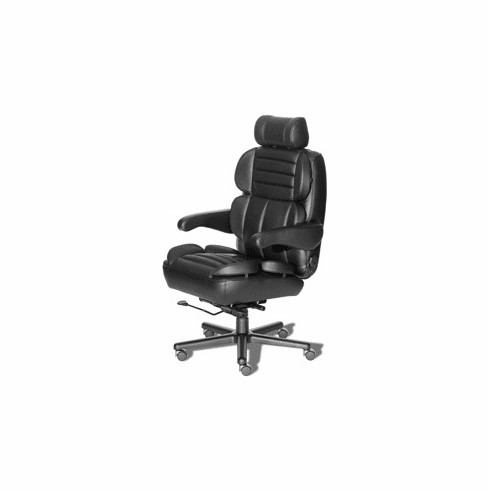 Features included premium contoured foam cushions, built-in floating spring suspension in the seat, a four-way adjustable headrest, and full adjustability. This chair is designed by a leading manufacturer of auto interiors, and the steel frame is warrantied for life. Choose fabric, leather, or vinyl upholstery, or a combination of leather and vinyl. Every ERA chair features a choice of stain-resistant fabric, commercial grade vinyl, leather with matching mock leather trim or you can upgrade to an all leather model. Other features of the Pacifica big and tall chair include an all steel lifetime warranted frame with built-in floating spring suspension in the seat, your choice of stain-resistant fabric, premium foam contoured cushions, 4-Way adjustable padded headrest, 2-Way adjustable lumbar support, adjustable seat depth, rocker reclining seat back, tilt tension adjustment, pneumatic seat height adjustment, 360-degree swivel, flip-up arms for easy entry/exit, heavy-duty aluminum base in chrome or black finish with heavy duty all steel frame nylon casters. Optional all steel 30-inch base available for minimal charge. Optional height/width adjustable task arms also available. ERA chairs are designed by a leading auto interior manufacturer and are individually crafted upon ordering. Every ERA chair is handmade in the USA. This chair meets or exceeds ANSI/BIFMA standards. Dimensions: Seat Size: 26"W x 21" - 23"D. Back Size: 22.5"W. Weight: 100 lbs. *This chair is custom made and normally ships within 4-6 weeks. It also has a 14 day return policy.